What is a reverse mortgage? They are pushed as the ideal solution for cash-strapped seniors. Companies advertise that if you are a Canadian homeowner over the age of 55, you can get up to 50% of your home’s value through a reverse mortgage. You will not be required to make any payments towards the principal or interest during your lifetime or for as long as you own the home; the mortgage is paid from the proceeds of the home’s sale. However, because you are not making any payments towards the debt, you end up paying interest on interest. The longer you live, the more you will owe. And reverse mortgages carry a higher rate of interest than a conventional mortgage. Because of this, reverse mortgages are almost never a good idea! The amount owed on this reverse mortgage increased by over $1M in under 20 years. In June, 1993 a little old lady obtained a reverse mortgage for $135,300.00. 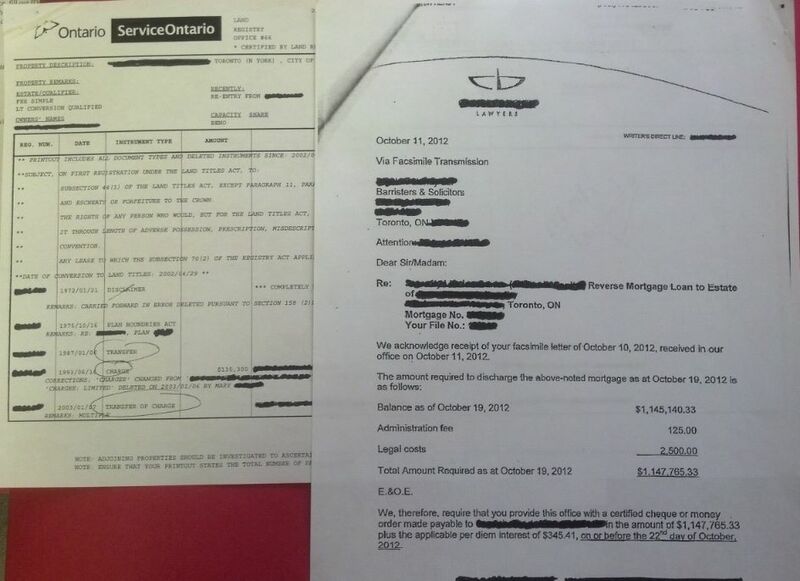 19 years later, the amount required to pay out that mortgage was $1,147,765.33!! Thankfully the property was in Toronto and its increased value actually covered the cost of the mortgage, but the beneficiaries of this lady’s estate were very disappointed to find out there was no equity left in the house.